A word of thanks must also go to all the fly tyers and sponsors of the prizes that were so kindly donated to the Association for this draw. 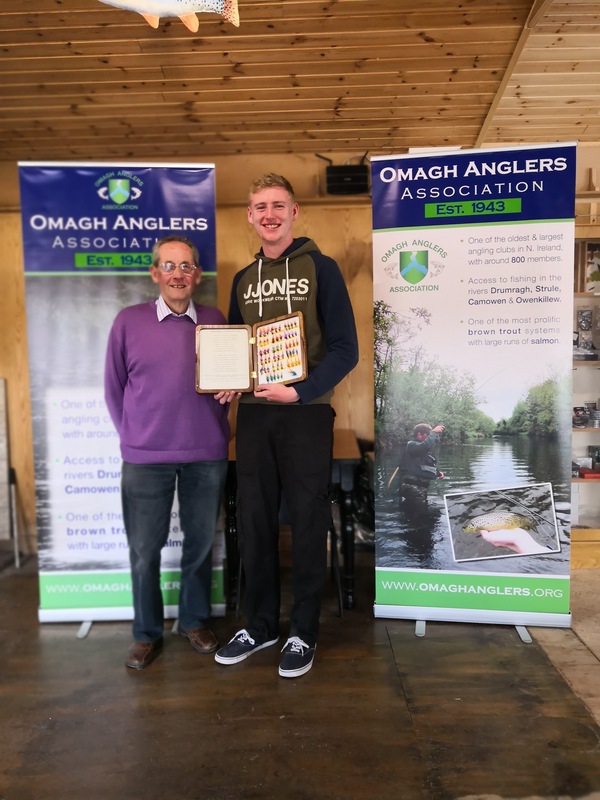 No money raised was retained by Omagh Anglers Association , all going to the two chosen charities. Our latest count had approx £1600 was raised for the two causes. The smaller prizes were drawn out first with all tickets being put back in for the major prize. Although it is somewhat unfair to call any of the prizes small as any prize was of good value and we had 17 prizes in total. All these tickets were drawn by Stevie Smyth of Birchwood. The star prize was then drawn after all previously drawn tickets were re- entered and this was drawn out by Ian Sproule owner of Birchwwod Fishery and this was won by Laura Smithson! ( I will talk nicely to her regards a price now!) The prize as seen in earlier posts was a handcrafted wooden fly box made by D Spratt and containing 55 salmon flies tied by local tyers J. Mc Donald, D Fulton and J Martin.